The VaporSpooler is ideal for distributors and retailers of Kanthal, Nichrome and other resistance wires for use in vaping or e-cigarette modifications. In some cases, it can also be used with ribbon wire. It makes the job of making neatly wound spools and coils from bulk spools fast, accurate and easy. The VaporSpooler can be set up very quickly for each combination of wire and spool to be wound onto. Once it is configured, the operator pushes one button to commence spooling. They can walk away as each spool is wound with neat and even tangle free layers. The system automatically stops with .6% length repeatability. The MultiSpool Quick Slide (MQS) attachment allows batches of spools to be wound for faster production. The MQS is included in all systems. Place your order below or Contact Showmark for a formal quotation. The winding speed is adjustable from 0-330rpm (750 feet per minute based on a 6 inch diameter take-up spool). An adjustable magnetic brake provides tension control with a range of .7 oz – 1.2 lb (based on a 6 inch diameter supply spool). Automatic or Manual Winding Modes allow unattended operation. A digital readout displays the total length of spooled wire with 1/10th foot resolution. It allows a preset rewind length up to 99999.9 feet. Other ranges and metric calibration are no charge options. Stopping repeatability: .2–8 inches depending on the operation method. 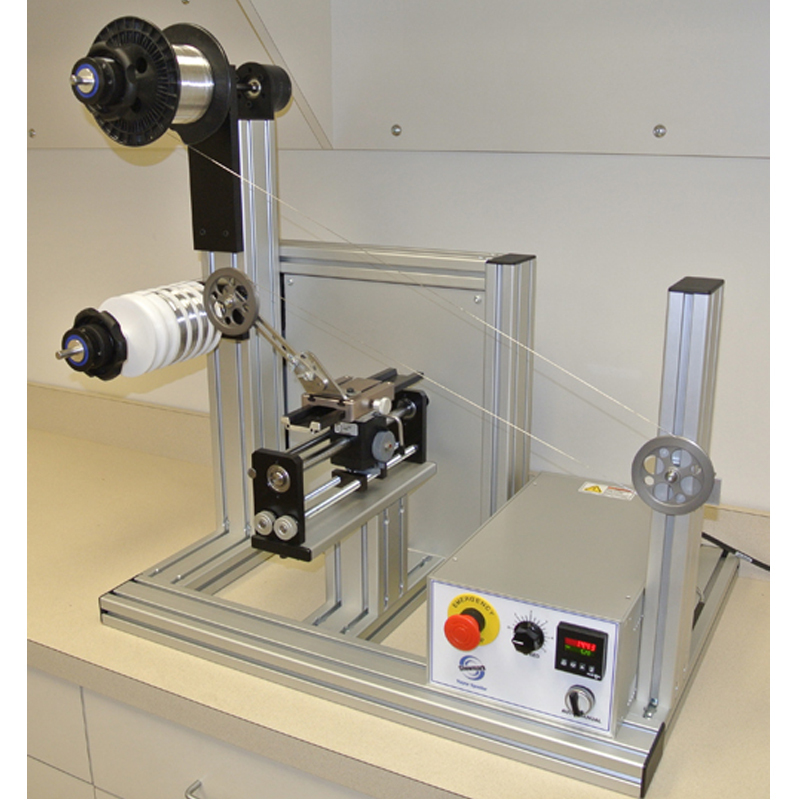 All systems include the MultiSpool Quick Slide (MQS) for winding batches of spools. A traversing wire guide head is synchronized with the motion of the take-up spool to provide even layers of material on the take-up spool. The winding pitch is adjustable from .005 – .050 inches (corresponds to 36 – 16 gauge wire). The travel length of the traversing system is adjustable up to 6 inches. All contact surfaces are low friction anodized aluminum rollers with a 35mm bending radius. The machine is available with 10mm or 3/8″ diameter shafts. Matching spool mounting systems are included. No tools are required. Spool flange diameters up to 12 inches can be mounted on the payoff and take-up shafts. The maximum spool weight should not exceed 10 lbs. Shipping charges for this item will be confirmed by phone after your order is reviewed. Approx. Gross Weight: 80 lbs., Dims: 32x32x32 Shipping method: UPS, charges paid for separately. This machine takes approx. 4 weeks for delivery. Contact Showmark for current delivery.